For these pages in my art journal I was experimenting with creating backgrounds using watercolour paints and found objects. The wavy lines are made with corrugated cardboard, the circles with bottle caps, and the little square criss cross shapes are made by splodging paint over plastic mesh with a foam dobber. It’s great fun to see what patterns you can make with things you find around the house. This morning when I was visiting my parents, Mum gave me a box of knick knacks to look through, random objects she has kept over the years in case they should ever come in useful, then forgotten about. I came home with a bag of goodies to use in my craft projects – old keys, wooden cotton reels, pieces of jigsaw puzzle, tiny light bulbs and little shells. I’m already planning what they’re going to be used for! 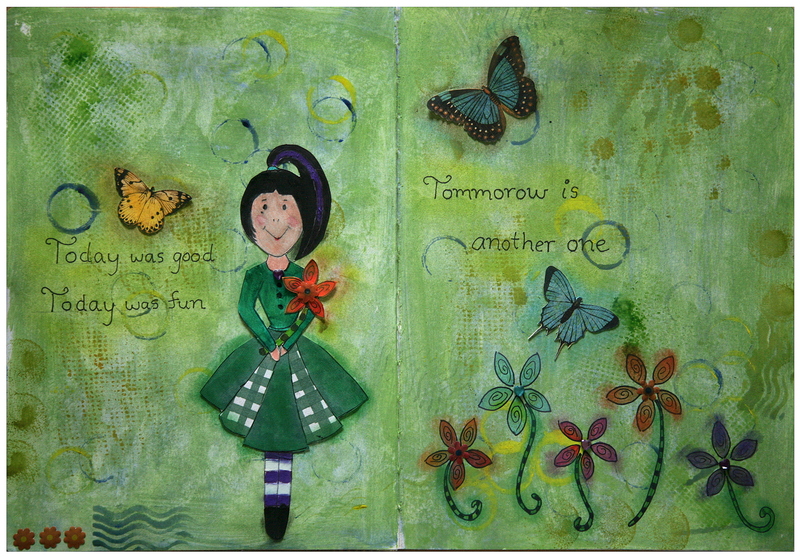 This entry was posted in Art journal, Crafts, Mixed-media art, My Blog and tagged art, art journal page, craft, Dr. Seuss quote, mixed-media art. Bookmark the permalink.